Summer’s here. While that means vacation and time off, your air conditioner and thermostat will be working overtime to keep you comfortable. How about giving them a break? Your AC is the biggest energy user in your home and the one to blame for a high summer bill. CPS Energy has several programs that can help you keep tabs on your AC and cut yourself a break on your summer energy bills. CPS Energy just launched a partnership with Nest to help you get a Nest Learning Thermostat™. If you have central AC, the Nest Thermostat can make the job of saving energy easy. It learns your temperature preferences to program itself and automatically adjusts itself to save you energy when you’re away from home. It can be controlled remotely from a smartphone or computer and its sleek design adds new life to any wall. You can get a Nest Thermostat at your local retail stores or online. Once you install it and sign up for the Nest Rush Hour Rewards program, you’ll receive a one-time $85 CPS Energy account credit. Rush Hour Rewards can help you use less energy during peak energy demand periods, or “energy rush hours,” while still keeping you cool and comfortable. Energy rush hours occur on hot summer days when ACs across San Antonio are running hard to keep homes cool, generally between 3 p.m. and 7 p.m. Combined, that’s a lot of demand for power. Utilities like CPS Energy will call a conservation event — a Rush Hour event for Nest Thermostats — when there may not be enough energy to go around. Rush Hour Rewards can help you use less electricity during peak energy rush hours while still keeping you comfortable. While everyone else is cranking up the air conditioning, it can automatically cool your home ahead of time or make minor temperature tweaks to your schedule. If you don’t like a temperature that Nest sets, you can change it at any time. When you enroll in Rush Hour Rewards, or any one of our Demand Response programs, and stay in that program through Sept. 30, you will be eligible to receive another $30 account credit. It pays to save. If the Nest Learning Thermostat isn’t for you, other Demand Response options are available to help you keep your summer bills under control. Home Manager is a FREE program that allows you to control your air conditioner, electric water heater and pool pump with your computer, smart phone or tablet. You can monitor your energy use and create programs to use those devices more efficiently and save money. Home Manager is a great fit if you: have central air conditioning; have Internet access or a smart phone; own your home; are away from the house for extended periods of time; and have an electric water heater. Keep it simple with CPS Energy Savers Smart Thermostat. With this program, you get a FREE Honeywell programmable thermostat. It’s a $300 value, you don’t have to install it yourself, and you have complete control. Change the temperature at home — anytime, anywhere — from the Internet using your work computer or laptop. CPS Energy now offers two new programs to help customers without a central AC system conserve energy. Friedrich’s Kühl Window AC units offer programmable energy management programs to encourage conservation. Sold only at Conn’s stores, these units can be purchased at a discount price and include a free wireless FriedrichLink adapter to help you manage temperature settings. If you enroll in the CPS Energy Kühl AC Program, you can receive up to $300 in credits to your account. Maybe you don’t need a whole new window unit? The Cool Energy Program smartAC kit is a free, wireless smart plug that connects to an existing window air conditioner. 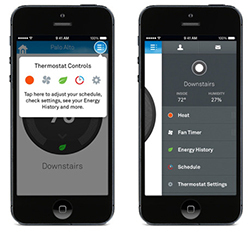 Like our other programs, temperature settings can be controlled via the Internet from a smartphone or computer. The smart AC kit is free when participants enroll in our Cool Energy Program. Learn more about our energy-saving demand response programs on cpsenergysavers.com. Go CPS! Glad to hear you’re on board with Nest! Good things happening. I’m signed up for the Nest Energy Rush Hour program! Thanks for hoping on board.